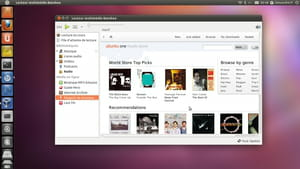 Ubuntu 64 bits is an operating system for laptops and computers which is packed on a "live CD". It contains useful programs to perform regular tasks on computer. Internet Browser: what is interesting with this program is that it already contains many ready-to-use programs. One of them are an internet browser. Indeed, it provides two default browsers, which are Ubuntu and Firefox to facilitate the internet access. Office: it is also able to read all types of office documents. It possesses his own word processing program called LibreOffice. Then, it is possible to open Word, Excel and Powerpoint format with Ubuntu 64 bits. Multimedia: apart from this, Ubuntu 64 bits manages all media files including videos, music, photos. It is even packed with a TV option to watch and organize music or video, while it is played on live on the web. Software Center: furthermore, Ubuntu 64 bits contains also many programs on different topics such as games, graphics, music player and many others. Apart from that, it is possible to download other applications from Internet for free. The operating system is completely free. Sometimes, there may be some problems when partitioning. Latest update on February 4, 2015 at 04:01 AM.